The victorious Netherton United Veterans team. Honours in local football’s last cup final of the season went to Netherton United. 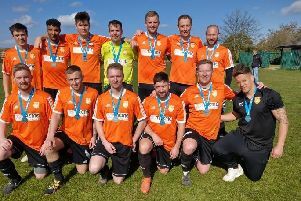 It was their team of golden oldies that beat Stamford Bels 2-0 in the final of the Peterborough League Veterans Cup at Yaxley FC on Sunday morning. On target for Netherton were Ash Favell and Glen Bolden. Stamford - Ian Flavell, Adrian Kennett, Dean Cornish, Terry Strange, Richard Taylor, Paul Attfield, Michael Partridge, Dave Lewis, Andy Gray, Luke Elsom, ‘Teddy’ Paling. Subs - Dave Stocker, Jon Morley. Netherton - Andy Yeoman, Nick Scott, Ian Fovargue, Steve Phillips, Keith Hogg, Darren Bradley, Darren Paling, Gary Roddis, Lee Challinor, Ash Favell, Glen Bolden. Subs - Lee Darcy, Matt Worsdall, Paul Smith, Gianni Salerno, Steve Beveridge.